This is essentially the ONLY face/pose I can get out of this kid anymore. He was being the Hulk, I think. Or maybe he was trying to smile nice. There is no difference between those two looks. So welcome to my spot in the sunshiny glow of the Made-By-Rae Lotus Pond Blog Extravaganza! I mean really, does this fabric line make you happy or what? The colors together are an unstoppable happiness force. Don't fight it. See Tara's blanket, if you doubt me. And if you just don't know what I'm talking about, check out Rae's brand new line of organic quilting cottons from Cloud 9. I was so excited to get to play with this gorgeous fabric! I made Hendrix an Oliver & S Sketchbook shirt using Snail Trail in gold and the Lily Pond print for a contrasting yoke. I made a size 6, but I think my just-turned-5 year old actually needs a 7 now. It just didn't quilt fit his chest right when it was buttoned and seemed a little short to me. Must be the Hulk muscles. But it's still pretty darn cute with that lily pad blue yoke. He bought the whole concept only because he has recently seen the movie Turbo, which is about a snail who wins the Indy 500. (huh?) And these days he is mostly really happy just to have me making him anything. I should do it more. His sister accumulates my makes only because of the sheer volume of cute little girl patterns and fabrics, but she never shows that kind of gratitude. Hrumph. I really enjoy cute buttons on the back of a dress. One of life's greatest satisfactions. I tried really hard to get those cute little hand-holding shots that one would expect from a perfect blogger like me with perfect kids like these, but this is what happened instead. I'm not complaining. Thanks so much to Rae and Cloud 9 because now these little weirdos have some extremely cute new summer duds. Check out the rest of the Lotus Pond projects over on Made By Rae, you will love them all to pieces. And if you are local, we should be getting the whole collection at Sewn Studio any day now! 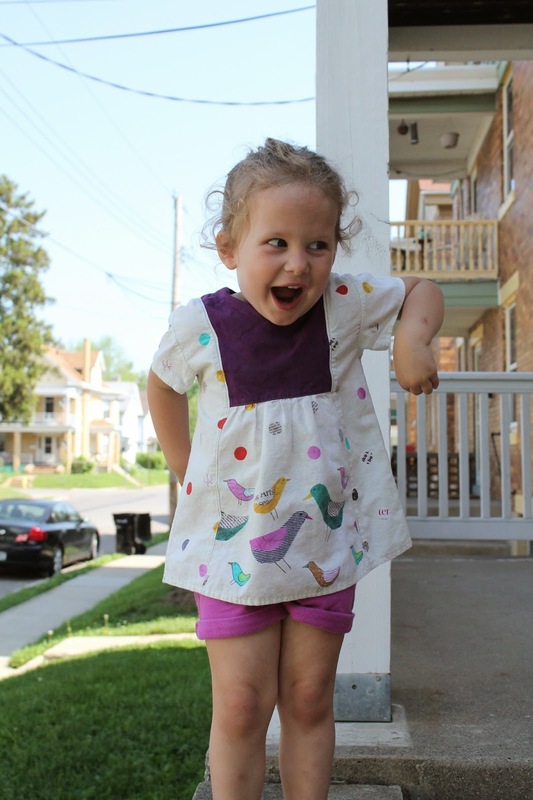 I made Elsie this Oliver & S Hide and Seek tunic about 6 weeks ago. Sooooo it's been washed and worn a lot before being blogged, as is my pattern lately. Still as adorable as ever, but that shot cotton I used on the yoke refuses to iron well. At least you can't see the spaghetti sauce stains near the birds, so there's that. It's pony-tail weather now, which makes Elsie look like such a big kid. She loves this shirt a lot. She's more of pants girl than a dress girl, so it's great that most O&S dress designs come with tunic or blouse options. I loved putting this one together too. It didn't take too long, but it's a unique construction that lends itself to really cool color blocking options. The bird border fabric is from Carrie Bloomston's first line Collage. I actually just saw her new Paint collection in person at Quilt Market over the weekend, and it's just as great as the first! There are some really cool prints that can be used uniquely in garment sewing. The yoke fabric isn't quite this dark in person and it's a Studio E Peppered Cotton. The tunic is sewn up in a size 3. Thanks so Liesl for sending me this pattern to try. As always, it was a joy to sew! You can pick yours up online here, or if you are local we carry the full line of paper patterns at Sewn Studio. 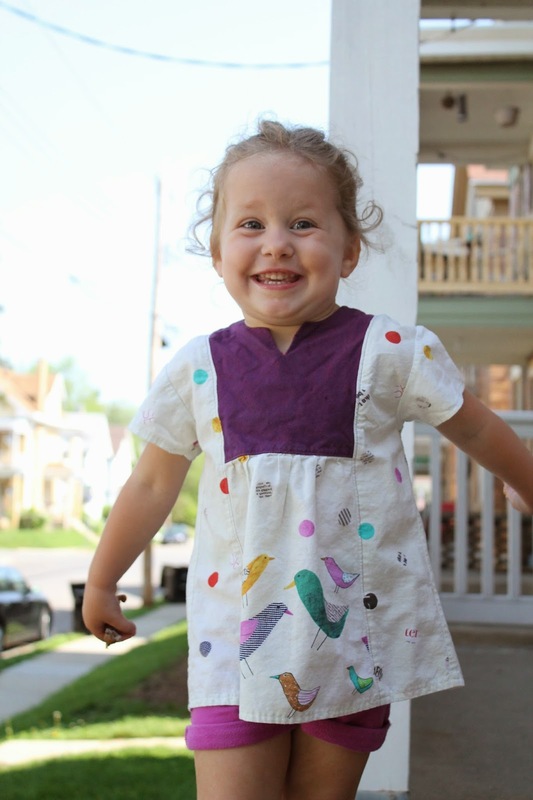 Come back next week to see what I made for both kids with Rae's beautiful Lotus Pond fabric. 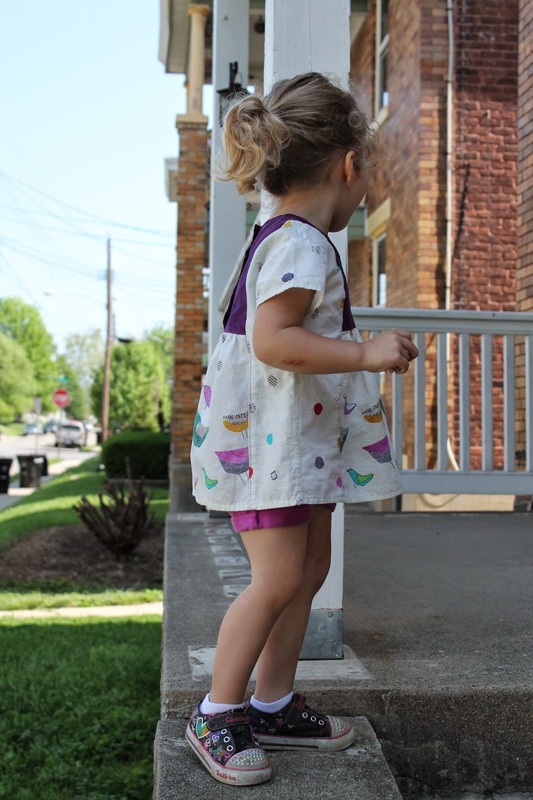 After that, I really need to let the kids wear out their summer hand-me-downs and focus on finishing some quilting projects AND sewing more clothing for me. I've actually just finished up 2 Liesl & Co Metro tshirts that I love, so hopefully I can get pictures to share those soon too. 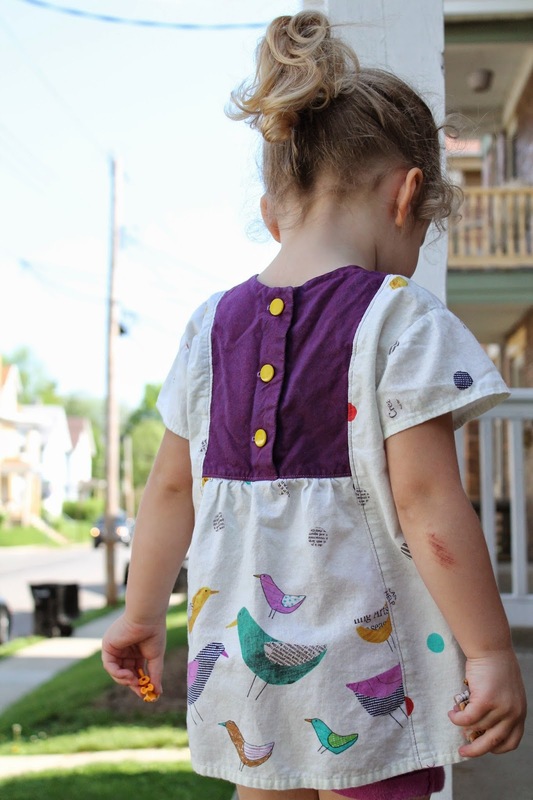 I have the hardest time lately with blogging my kids' clothes before they get dirty and slightly trashed. So why not embrace the reality of kid slime? No ones kids actually look that clean by lunch time in the spring anyway. And goodness knows I'm not together enough to get blog photos taken in the morning. So I followed the kids (with cutey little school friend on the left) on a walk yesterday when they set out to make treasure paths on the sidewalks. 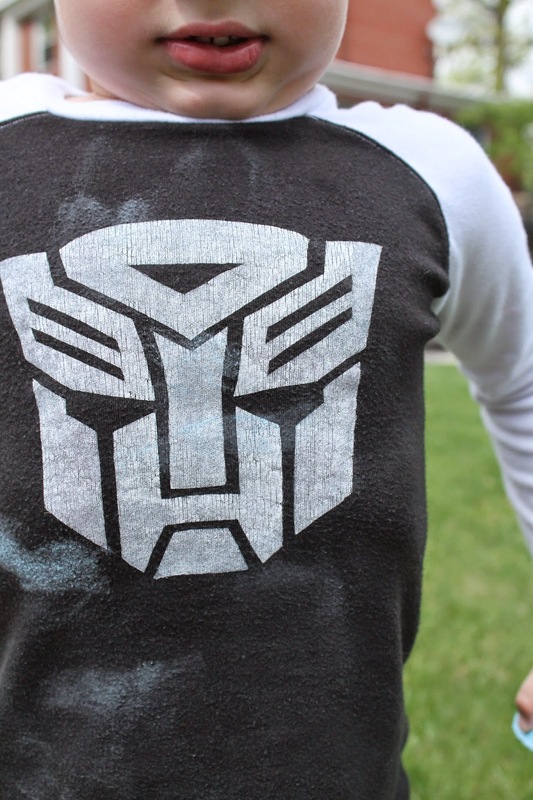 I made Hendrix this Autobot tee to wear to his fifth birthday party a couple weeks ago. The Autobots are the good-guy Transformers, led by Optimus Prime of course, and that's their symbol. I made the raglan with some cheap interlock from Joann (I prefer the nicer stuff normally, but birthday parties are expensive. So I was being cheap.) It's the raglan pattern out of the Sewing for Boys book, in the size 7/8. That pattern worked fine on him when he was smaller, but I'm not crazy about the fit of this one. I need to switch to Field Trip raglans for my kids, not sure why I haven't yet! Of course, the freezer paper stencil was the fun part. I gave Hendrix the shirt right before his birthday party. He was trying to watch something so he mumbled a thanks without barely glancing at it. I told him to look at the front and he exploded off the couch in excitement, "I LOVE IT!" The pants are Oliver & S After School Pants, once again. Still my favorite pants ever. They are in teal Robert Kaufman Shetland flannel, which is the coziest ever. I made these a couple months ago, when the weather was still very cold and Hendrix had already worn through the knees of his store-bought jeans. I hate that! This flannel, along with the relaxed fit of the pants, won't do that. I decided to get a little crazy with the pockets in Alison Glass' Sunprint. I hate how his outfits tend to get so dark and boring, partly due to the dismal color selection in the boys' department and partly due to the fact that his favorite color ever is black. Little touches like chartreuse pockets make me happy. He thinks his spacey rain boots match everything perfectly this spring. Ok, I like your style kid.